Samuel Moore “Sam” Walton (March 29, 1918 – April 5, 1992) was an American businessman and entrepreneur best known for founding the retailers Walmart and Sam’s Club. Sam Walton was born to Thomas Gibson Walton and Nancy Lee, in Kingfisher, Oklahoma. He lived there with his parents on their farm until 1923. However, farming did not provide enough money to raise a family, and Thomas Walton went into farm mortgaging. He worked for his brother’s Walton Mortgage Company, which was an agent for Metropolitan Life Insurance where he foreclosed on farms during the Great Depression. He and his family (now with another son, James, born in 1921) moved from Oklahoma to Orlando, Florida. There they moved from one small town to another for several years. While attending eighth grade in Shelbina, Missouri, Sam became the youngest Eagle Scout in the state’s history. In adult life, Walton became a recipient of the Distinguished Eagle Scout Award from the Boy Scouts of America. After high school, Walton decided to attend college, hoping to find a better way to help support his family. He attended the University of Missouri as an ROTC cadet. During this time, he worked various odd jobs, including waiting tables in exchange for meals. Also during his time in college, Walton joined the Zeta Phi chapter of Beta Theta Pi fraternity. He was also tapped by QEBH, the well-known secret society on campus honoring the top senior men, and the national military honor society Scabbard and Blade. Additionally, Walton served as President of Burall Bible Class, a large class of students from the University of Missouri and Stephens College.Upon graduating in 1940 with a bachelor’s degree in economics, he was voted “permanent president” of the class. Walton joined J. C. Penney as a management trainee in Des Moines, Iowa, three days after graduating from college. This position paid him $75 a month. Walton spent approximately 18 months with J. C. Penney. He resigned in 1942 in anticipation of being inducted into the military for service in World War II. In the meantime, he worked at a DuPont munitions plant near Tulsa, Oklahoma. Soon afterwards, Walton joined the military in the U.S. Army Intelligence Corps, supervising security at aircraft plants and prisoner of war camps. In this position he served at Fort Douglas in Salt Lake City, Utah. He eventually reached the rank of Captain. 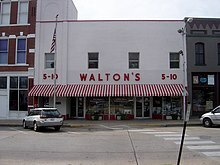 In 1945, after leaving the military, Walton took over management of his first variety store at the age of 26. With the help of a $20,000 loan from his father-in-law, plus $5,000 he had saved from his time in the Army, Walton purchased a Ben Franklin variety store inNewport, Arkansas. The store was a franchise of the Butler Brothers chain. Walton pioneered many concepts that became crucial to his success. Walton made sure the shelves were consistently stocked with a wide range of goods. His second store, the tiny “Eagle” department store, was down the street from his first Ben Franklin and next door to its main competitor in Newport. With the sales volume growing from $80,000 to $225,000 in three years, Walton drew the attention of the landlord, P. K. Holmes, whose family had a history in retail. Admiring Sam’s great success, and desiring to reclaim the store (and franchise rights) for his son, he refused to renew the lease. The lack of a renewal option, together with the prohibitively high rent of 5% of sales, were early business lessons to Walton. Despite forcing Walton out, Holmes bought the store’s inventory and fixtures for $50,000, which Walton called “a fair price”. Walton’s Five and Dime, now the Wal-Mart Visitors Center, Bentonville. With a year left on the lease, but the store effectively sold, he, his wife Helen and his father-in-law managed to negotiate the purchase of a new location on the downtown square of Bentonville, Arkansas. Walton negotiated the purchase of a small store, and the title to the building, on the condition that he get a 99-year lease to expand into the shop next door. The owner of the shop next door refused six times, and Walton gave up on Bentonville when his father-in-law, without Sam’s knowledge, paid the shop owner a final visit and $20,000 to secure the lease. He had just enough left from the sale of the first store to close the deal, and reimburse Helen’s father. They opened for business with a one-day remodeling sale on May 9, 1950. Before he bought the Bentonville store, it was doing $72,000 in sales and it increased to $105,000 in the first year and then $140,000 and $175,000. With the new Bentonville “Five and Dime” opening for business, and 220 miles away, a year left on the lease in Newport, the money-strapped young Walton had to learn to delegate responsibility. In 1954, he opened a store with his brother Bud in a shopping center in Ruskin Heights, a suburb of Kansas City, Missouri. With the help of his brother, father-in-law, and brother-in-law, Sam went on to open many new variety stores. He encouraged his managers to invest and take an equity stake in the business, often as much as $1000 in their store, or the next outlet to open. (This motivated the managers to sharpen their managerial skills and take ownership over their role in the enterprise.) By 1962, along with his brother Bud, he owned 16 stores in Arkansas, Missouri, and Kansas (fifteen Ben Franklins and one independent, in Fayetteville). The first true Wal-Mart opened on July 2, 1962, in Rogers, Arkansas. Called the Wal-Mart Discount City store, it was located at 719 West Walnut Street. Soon after, the Walton brothers teamed up with Stefan Dasbach, leading to the first of many stores to come. He launched a determined effort to market American-made products. Included in the effort was a willingness to find American manufacturers who could supply merchandise for the entire Wal-Mart chain at a price low enough to meet the foreign competition. This profile is partly adapted from a Wikipedia entry on Sam Walton, available under the Creative Commons Attribution-ShareAlike License.